“Can we see the basement now?” Frank asked their realtor. “Because that… is where people… get murdered.” She answered. “Are you serious?” He said laughing, the corners of his mouth turning up as if her next line was to say she was only kidding. “I’m dead serious, Frank. Every movie you have ever seen where people wander into the basement— those people get murdered. Let’s move onto the bedrooms upstairs,” and she turned to walk away from him. Confused, Frank looked to his wife for support. “Gina… I’ll be right back. Go with Julie, please.” He realized he was dealing with an idiot and started off. “Frank! Stop right there!” Julie said halting him. Regretfully, he stopped, tilted his head back in annoyance and turned to see she never missed an opportunity for a pose with her tone arms crossed, her perfectly manicured nails strumming lightly along her forearm to the clank of expensive bangles and bracelets on her wrist, her balletic legs one in front of the other to reveal the tautness of her Peloton shaped calves. “There’s nothing to see down there, Frank… Nothing! It’s a basement. It’s empty…. The solar inverters, Tesla battery storage and state-of-the-art hybrid furnace are in the garage. There aren’t even windows down there, Frank, and for a good reason, the basement is where people get murdered,” she fired off in quick succession, her agitation making their choice in a realtor, questionable. Julie closed her eyes and took in a slow breath then exhaled lightly to calm herself as her yoga training has taught her. “Fine… If you want to get murdered in the basement, Frank? That’s fine by me, but you might want to ask your wife if that is fine with her, she said uncrossing her arms and gracefully invited Gina to weigh in. Frank could see his wife’s brows rise and her lips pinch as if holding back a laugh. Not sure what to make of this, he said nothing and headed back through the kitchen toward the basement door, with it’s industrial bolt cinched into place. With Frank’s exit, Julie huffed and stormed out from the dining room, leaving Gina to follow, the heels of Julie’s Louboutins stabbing at the travertine tile leaving the clatter of echoes in their wake. Gina kept up, but was thinking about Julie’s talk of people getting murdered in the basement. It was silly… she knew… but what if Frank did indeed get murdered in the basement? She would never forgive herself. She pushed these thoughts from her head and followed Julie up the staircase, her hand sweeping along the curved cherry banister which felt like silk to the touch as she admired the finely tapered rungs with hand carved fluted tops, like tiny hands holding it up from below. Julie paraded Gina through the two finely appointed guest suites with their private baths fitted with quartzite countertops and glass vessel sinks that with a touch along the counter edge, the vessels lit up from below. Next, she led Gina down the hallway and surprised her with a concealed sliding door that revealed a laundry room fit for a queen. Further down the hallway they passed a servant staircases that led down to the kitchen and adjacent to the master suite, where Julie stepped aside affording Gina the unobstructed and spectacular view through the floor to ceiling windows looking out over the russet reds and virulent greens of the marshland beyond. “It’s breathtaking.” Frank is going to die when he sees this view,” Gina said, pulling up her shoulders in such anticipation of surprise. Julie responded with a quiet ‘hmm’ as if to say, we’ll see about that. “Yes. Isn’t the view delicious,” she muttered as if a compulsory response was needed, her hand reflexively dusting away a fleck from her lapel. “Speaking of which, where is my husband?” Gina said stepping back from the threshold past Julie to the staircase in hopes of seeing him. When she turned around, Julie was looking at her watch, leaning against the frame of the doorway with her arms folded. Gina was confused. She hadn’t even stepped into the master suite and loved everything about this home. “But I love this home…. Oh, I know I should never tell a realtor that, but you already know I just love it. Don’t tell Frank I told you,” she said in a hushed whisper. “You will need not worry about what Frank will think,” Julie commented as she straightened out her Channel jacket and started down the staircase, leaving Gina shocked. “Wait!” Gina called after her from the top of the stairs, watching Julie take each step in disappointment, a sale gone to waste. “Shouldn’t we wait for Frank to see the Master? That spectacular view?” With no acknowledgement, Gina, having once found Julie’s peculiar personality almost charming, was now ebbing to the point of anger. Who’s the client here, she found herself thinking as she began to follow Julie down the staircase like an abandoned puppy. Never looking back, Julie walked through the kitchen and dining room to the foyer and looped her finger through the lockbox that rested upon the emerald veins of the Biedermeier console near the entrance, then opening the front door, she ushered Gina to step out and around her so she could lock up the house. “Stop… Just stop! ” Gina screamed out facing the street with her arms locked straight down by her sides. She spun around to face Julie and stomped past her back into the house. Julie knew it was pointless to call her back and went about her business of shutting the front door and securing the lockbox in place before returning to her Mercedes n the driveway, cell in hand about to dial her next client. Gina heard the door shut behind her–the last straw–It’s time to get a new realtor. 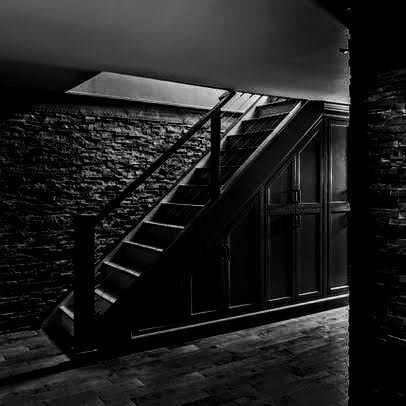 She stomped through the dining room and kitchen sweeping her hand along the deeply turquoise granite island to the open door leading down into the basement and stood at the top of the staircase, the dim Edison bulb illuminating the unfinished concrete floor below. “Frank!” she called out. There was no answer. “Frank!” She called again. A slight crack in her voice this time as she apprehensively started down the staircase, ducking her head below the transom of the ceiling, taking each step slowly until she reached the landing where the souls of her feet felt the crumble of cement pellets while her head was filling with stupid thoughts from Julie. She walked out to the edge of light looking into the pitch of blackness beyond. “Frank? … Come on…. I want to show you the master,” expecting Frank to jump out from the shadows at any moment. Nervously, she brushed back her hair, crouching slightly with her knees pointing inwards. “It’s not funny, Frank!” Come on. Julie’s has left us…. She even locked us in! We need a new realtor, Frank!” She felt a cold sweep of air rush by her leaving the smell of dank wetness in her nose. She couldn’t understand why people built basements in the first place. She would never use one let alone go down into one. But here she was. The light switched off and she heard the door at the top of the staircase shut. “You Fucker! That’s not funny, Frank. Turn the light back on!” There was no answer and fright had taken hold. She was truly scared as more thoughts flooded her mind knowing Frank was taking advantage of it. She jumped and screamed out when she felt a hand on her shoulder. Reaching up she felt her husband’s hand; a hand she knew was his, the smooth top and callused sides from his craft as a sculpture. She held onto it bringing it down by her side but it seemed too light, no resistance. Terror gripped her when she realized there was nothing attached to it. This entry was posted in End Of Days, short stories and tagged Halloween Story, Horror story, sci-fi short by Dave. Bookmark the permalink.